While enjoying his new outdoor smoker, my husband smoked a whole chicken. Normally, we will eat some of the smoked chicken and then save a bit for another meal. What to do with the leftover smoked chicken? 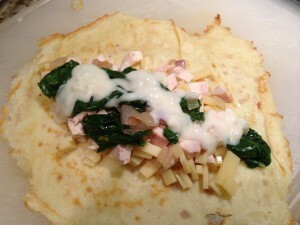 I had some pre-made crepes in the freezer so I created Smoked Chicken Crepes with Spinach and Shallots. 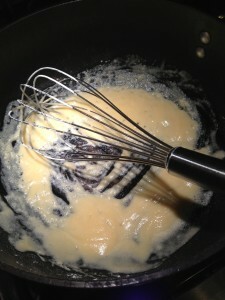 Start with a roux to make a white sauce. Add milk, minced onion, paprika, and a bay leaf. Simmer. Then add some freshly grated Parmesan cheese and set aside. Make your own crepes or buy some pre-made crepes. If you don’t have any smoked chicken meat, and your grocer doesn’t carry it, you can use regular cooked chicken breast. Or you can order smoked chicken breast from D’Artagnan Foods. Cut the chicken meat into a small dice. 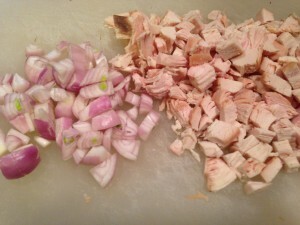 Chop some shallots. Saute the shallots and some minced garlic in butter and then add some fresh spinach leaves. Cover the pan and remove from heat so the spinach will wilt. 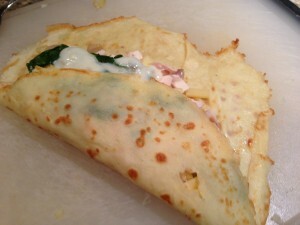 Put the chopped chicken and some shredded Swiss cheese into the crepe as a filling. Top the filling with the shallot and spinach mixture. Drizzle some white sauce over the filling. Place the filled crepes into a baking dish. I used two crepes per individual baking dish for a two-person meal. 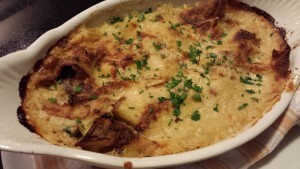 Top with the homemade Parmesan white sauce or you can use a jarred Alfredo sauce. 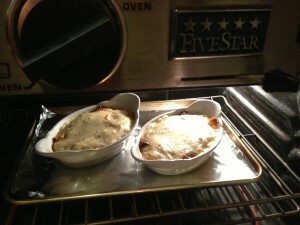 Bake for 30 – 45 minutes at 325 degrees Fahrenheit. Let cool for about 5 minutes in the baking dish. 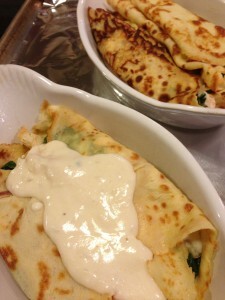 Baked Smoked Chicken Crepe with Spinach and Shallots is ready to be served! Sprinkle on some chopped parsley and serve! Finely chopped parsley, to garnish. 1. Preheat oven to 325 degrees Fahrenheit. Spray two baking dishes (or one large baking dish) with cooking spray. Set baking dishes aside. 2. Melt the butter in a saucepan over low heat. 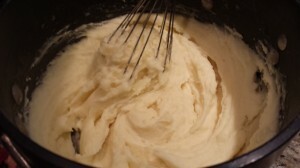 Whisk in the flour and cook for three minutes, whisking constantly. 3. 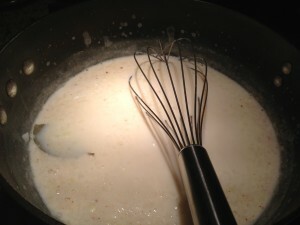 Add the milk slowly, whisking it in until smooth. 4. Stir in the minced onion, paprika, and bay leaf. Simmer until sauce thickens. 5. Stir in Parmesan and remove from heat. Set aside and keep warm. 6. Warm the olive oil in a pan over medium heat. 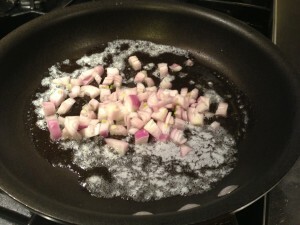 Saute the shallots until translucent. Add the garlic and saute 2 minutes longer. 7. Add the spinach to the pan and toss with the shallots and garlic. 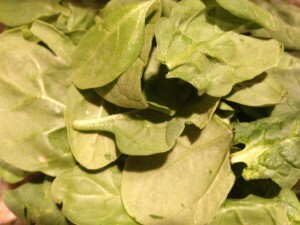 Sprinkle some salt and pepper over the spinach mixture. Cover pan and remove from heat. 8. 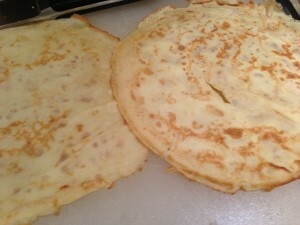 Place the four crepes on a large cutting board. 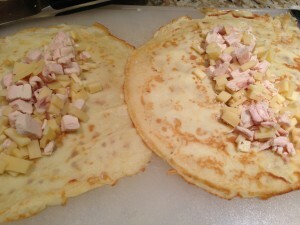 Divide the chopped smoked chicken and the Swiss cheese amongst the four crepes. 9. 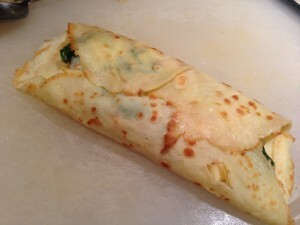 Divide the shallot, garlic, and spinach mixture amongst the crepes. Spoon some white sauce over the spinach mixture. 10. 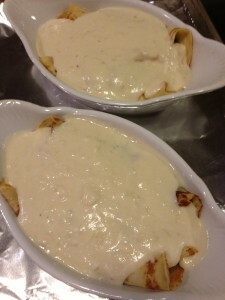 Spoon enough white sauce into each baking dish (or the one large baking dish) to cover the bottom lightly. 11. Roll up the crepes and place two crepes in each baking dish (or in one baking dish if you are baking them all together). 12. Cover the crepes with the remaining white sauce. 13. Bake the crepes for 30 – 45 minutes. 14. Remove from oven, cool for 5 minutes, garnish with chopped parsley and serve! 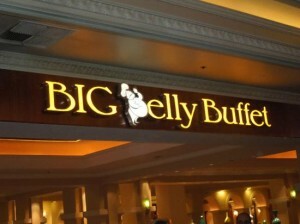 Serves 2 as a main course or 4 as an appetizer course. 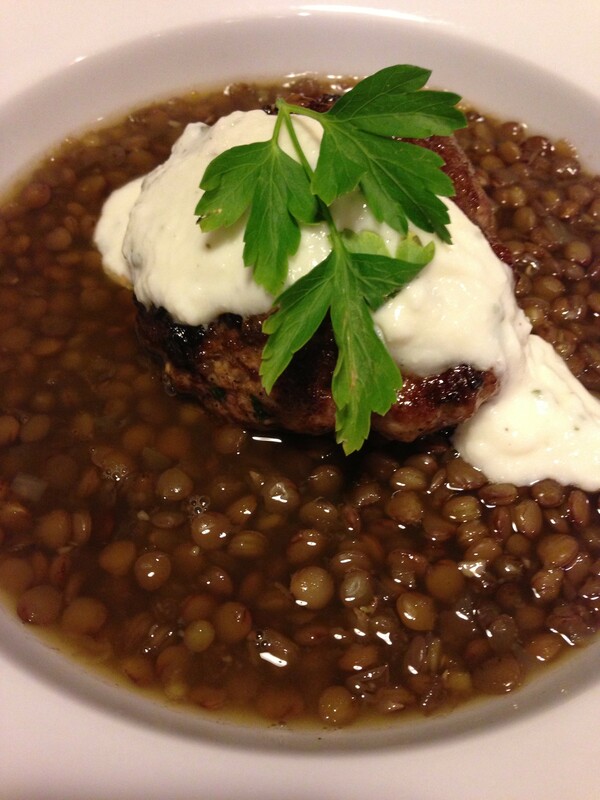 As a main course, serve with a nice ripe tomato cucumber salad or a green vegetable on the side. 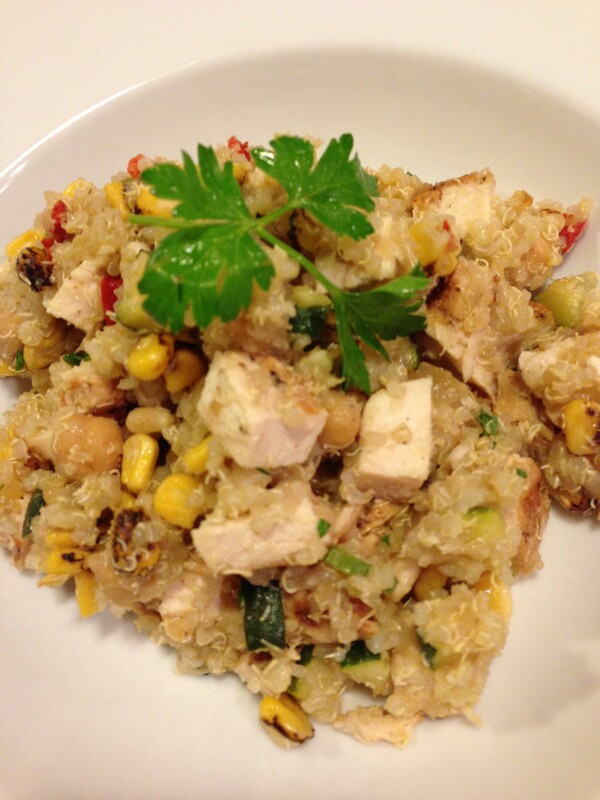 Variations: Use regular cooked chicken breast if you don’t have smoked chicken. 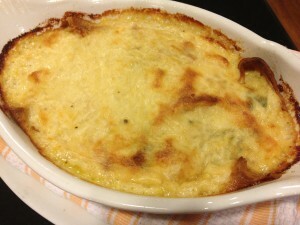 Substitute Monterey Jack cheese for the Swiss cheese. 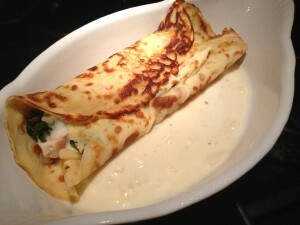 If you can’t find crepes, and don’t want to make them, you can stuff cannelloni pasta with the smoked chicken filling. To lighten this recipe, make a chicken stock-based white sauce with less milk or use fat free milk. Use fat free cheese. 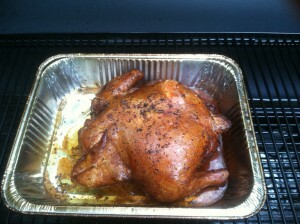 If you can’t find smoked chicken, order some from D’Artagnan Foods.